Windows needs the source files. But how can Windows find them it they’re not on the disk? Microsoft suggest that you copy all files locally and do the activation with DISM. 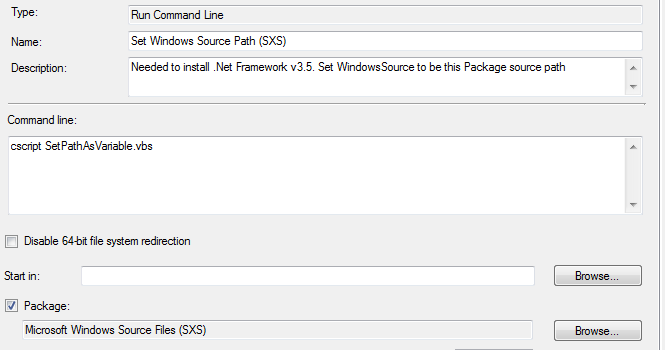 Another solution is to set a Task Sequence variable (WindowsSource) to point to the package with the Source files. (Thanks to Peter van der Woude in this thread for this idea.) When Windows has a WindowsSource-variable set it’ll automatically know where to look for the DotNet-source files. 1) Create a SCCM-package with all files from the “\sources\sxs” folder on the Windows8/Server2012 iso/DVD. 2) Copy my script “SetPathAsVariable” to the root folder of this package. (Link to script below) This script will set the WindowsSource to the root of the package where all the Source files are (which is on the Distribution Point). 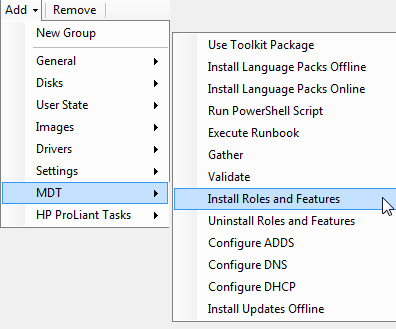 3) Create a task-sequence step before the “Install Roles and Features” which runs said script. Here’s the script that you’ll need to place in the package-root for your Source-files. Remember to rename it to *.vbs after you download it. Hope it helps someone! Give me a comment to keep my happy! I tried this but it failed, do not know what I did wrong, followed the procedures to the letter. 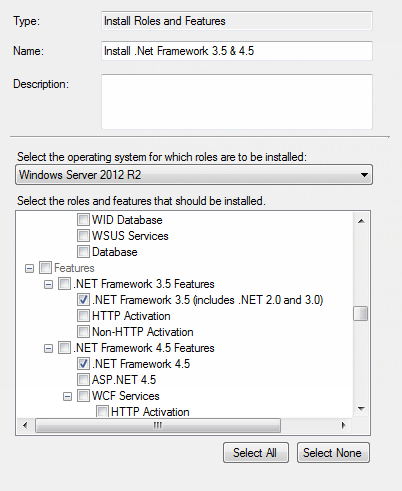 Works perfectly with SCCM 2012 R2 CU4 and MDT 2013, thanks a lot!